Phytoplankton, which color ocean waters green, bloom off Denmark in 2004. When seas change color, storms change direction, study suggests. 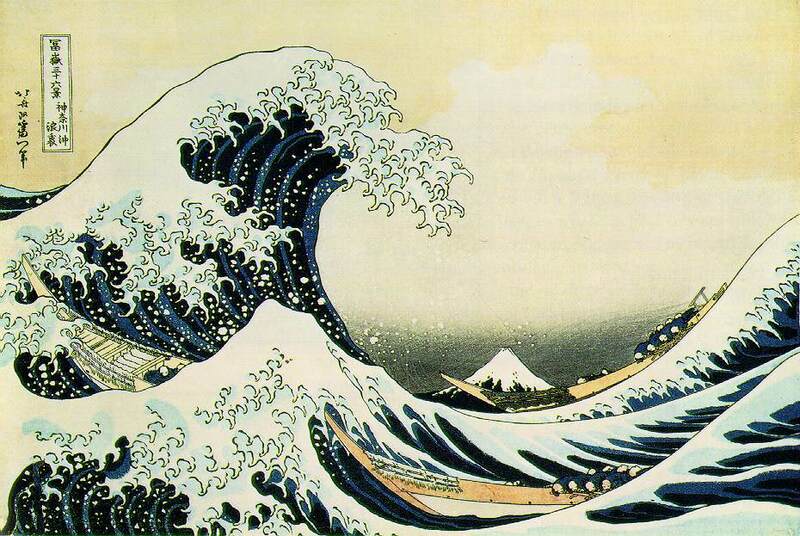 For centuries, artists from Hokusai to Hopper have used the ocean's colors to move people. Now a new study says they have the power to move hurricanes too. What's more, global warming may already be changing the ocean's color—and therefore helping to determine who hurricanes will hit, and who they'll spare. Led by oceanographer Anand Gnanadesikan, the study used computer simulations to look for links between ocean color and strong tropical cyclones—called hurricanes in the North Atlantic Ocean and the northeastern Pacific and known as typhoons in the northwestern Pacific. "Our group develops climate models," said Gnanadesikan, of the U.S. Geophysical Fluid Dynamics Laboratory in Princeton New Jersey. "One of my jobs is to try to make those more realistic." One way to make the models more realistic is to look more closely at little-studied variables, such as ocean color. In the North Pacific the predominant color is green, thanks to an abundance of minute, chlorophyll-packed plants called phytoplankton. By absorbing sunlight, the floating plants help keep the ocean surface relatively warm. When there are fewer of them, the sun's heat concentrates deeper down. In their climate model, the researchers reduced the plankton in North Pacific gyres—vast spiraling currents that can span an entire ocean. "The gyres are already pretty clear, and we made them completely clear," said Gnanadesikan, whose study is to be published in a future issue of the journal Geophysical Research Letters. By clarifying the waters in the gyres, the team robbed the gyres' shallowest waters of heat—a crucial change, since warm surface water is fuel for strong tropical cyclones. Tropical cyclones tend to form along the Equator, over the warm waters of the tropics, then move northward or southward into the subtropics. In the northwestern Pacific, for example, cyclones generally drift north and hit Japan and China. But in the computer model—with the North Pacific gyres drained of color and heat—the number of hurricanes moving northward out of the tropics dropped by two-thirds, versus the normal number. The storms simply couldn't continue on without warm surface water to sustain them. With clearer seas to the north, the cyclones tended to hug the Equator and hit the Philippines, Vietnam, and Thailand. "This was a huge, huge impact from removing all color" from the gyres, Gnandesikan said. "I was really quite surprised." Gyres are considered "'ocean deserts' because of their low level of productivity"—their ability to foster life-forms, such as phytoplankton—said biogeochemist Manfredi Manizza. The gyres, will likely "become even less productive because of the warming of the climate," said Manizza, of the Scripps Institution of Oceanography in California, who was not part of the new study. This clearing of the oceans may already be happening, according to a recent study in the journal Nature. As the ocean surface warms, it mixes less with cooler, deeper waters, which contain much of the oceans nutrients, the Nature study says. As shallow-water plants, phytoplankton are therefore starving to death, according to the findings. But Gnanadesikan, the computer model study leader, said that other studies have found a rise in plankton in recent decades. "The big problem in estimating chlorophyll changes [in the ocean]," he said, "is that there's really only one good record, from a satellite that's been up for 12 years"—NASA's Sea-viewing Wide Field-of-view Sensor. In the future, though, Gnanadesikan and his team aim to use ongoing satellite data to track changes in ocean color, and to see if there's a real-world link to tropical cyclone paths.